Many people look at aging as a negative. However, scientific research shows that there are many benefits associated with getting older. Following are seven perks Oshkosh in-home caregivers can share with their senior loved ones. Dr. Saverio Stranges studied the attitudes of various age groups. He found that by far, older adults are happier than their middle-aged counterparts. 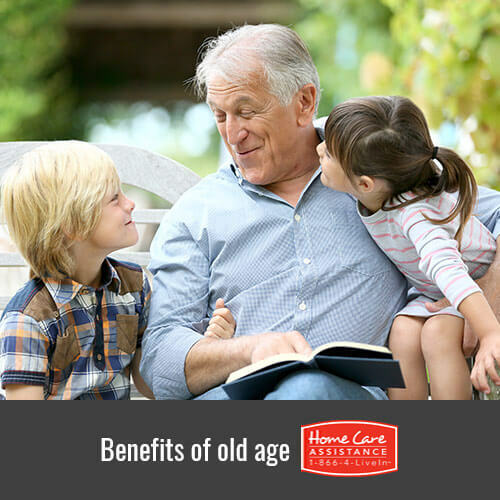 Based on their life experiences, seniors are additionally better able to deal with hardship and negativity. Having grandchildren expands the circle of love that older adults experience. Grandparents develop more fully emotionally and socially when having the opportunity to have a relationship with their grandkids. Getting older means not having to manage the challenge of raising a family or the stress of work-related issues. Once retirement occurs, older citizens have more time to spend with family members and friends, which increases the quality of their lives. With more time on their hands, seniors have the chance to fulfill their dreams or passions. These pursuits might include anything from devoting more time to a hobby, developing a new skill or traveling. Experience and knowledge culminate in a broader life perspective. Elderly adults often turn their focus toward making their community a better place for others. According to the Bureau of Labor Statistics, compared to other age groups, more seniors volunteer in their communities and vote. An article published in Smithsonian Magazine revealed that studies suggest that older people exhibit a greater degree of emotional and intellectual stability. When engaged in competitive events, senior adults express less regret or disappointment when not coming out on top. The same Smithsonian article also revealed that when asked to give advice for resolving conflicts, seniors demonstrated empathy and social awareness that surpassed other age groups. When it comes to growing older, seniors have a lot to look forward to. Let Home Care Assistance of Oshkosh help your senior loved one make the most of his or her senior years. Our flexible live-in and hourly caregivers work around your loved one’s schedule to assist him or her with everyday activities such as personal care and housekeeping to boost both physical and emotional wellbeing. Learn more by calling 920-710-CARE (2273) today to talk to a friendly Care Manager.